Join us on Saturday for a cheek swabbing during the Macan It Happen Bone Marrow Donor Drive and you’ll be entered to win a Rendezvous Package for two courtesy of The Raphael Hotel which includes accommodations in a luxurious room or suite, a three course, romantic meal at Chaz on the Plaza. Already on the Be The Match registry? Excellent! You’re entered to win too…with any financial contribution to Be The Match. Who’s ready for Saturday? Who’s ready to Be The Match? 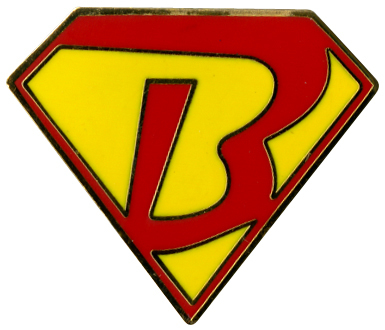 Super Bo pins are here! Kim McKinnon designed two adorable Super Bo pins for Team Macan It Happen (thank you, Kim!!!). They’re $12 each or two for $20. Thanks for Macan It Happen! Last Wednesday in Cincinnati, Bo’s port would not flush- no big deal. Well it actually was a big deal. They told me to have it looked at when we get home! Mind you we drove 600 miles to this hospital and 600 miles home. I couldn’t get into the doctor Monday, so we went Tuesday at 12:45. We got to the lab and the IV team (Vanessa) was awesome. She couldn’t get it to work either, so she immediately took us up to the infusion clinic so we could put some meds in it to get it to flush! Four hours later no flushing. The IV team came back and said he needed a chest x-ray. We had the x-ray done and I noticed it looked a little different from when he had it placed only 7 weeks ago. They sent us home. We got home at 7pm and I gave Bo and Brookie a bath- no big deal. At 8:55 my cell phone rang and it was one of our doctors. She was very shook-up and very adament that we had to get back to the hospital right away!!! I said “Okay.” She said “Carolyn, Bo’s port has come apart and the tubing is in his pulmonary artery.” I was like WTF!!! I very calmly said, “What do you mean?” She again was not trying to freak me out BUT she was freaking out so I started to panic a little. I get off the phone and I had to go tell John we had to go back to the hospital and this is why… I started crying. I couldn’t wrap my brain around what I had just told my husband. I called in the troops and everyone came and got the other kids and we headed back to the hospital. She called me again on our way to make sure we were on our way. We arrived at the hospital and everyone we spoke to looked at us like, “Oh, that’s the kid with the tube in his heart…” We were moved up to PICU and waited until morning to see what was next. Clearly we knew it had to come out, but how, where, when?? I, again, can’t believe what is happening my already very sick 2 year old. He just became even more sick, and it was something that was totally out of our control. They have no idea how it happened, they have NEVER seen a port break like this! Wednesday morning, well closer to noon, they took us to the pre-op (and the most amazing pre-op team- maybe because all of them were about to witness something they may never see again??). The intervention radiologist came over and talked us through everything, I mean everything. We got to walk Bo all the way to his operating room where we said goodbye to our baby and placed him in the hands of the people who where supposed to fix it save his life!!?? You know when i said parenting was not easy? This by far was the hardest thing John and I ever had to do: hand off our baby to have a tube taken out of his heart and lung. The doctor went in through Bo’s groin in his right leg and he ran it up through his little body and had to run it through his heart and into his lung to get the piece of tubing out. He promised us if in the first 3o min he couldn’t get it then he would stop and we would have to be transferred and have open heart surgery. Fifty-three minutes into surgery (it took them 20 min to get him to sleep and prep him) the nurse called me and said the tube was out!!! BUT they still had a long way to go. They had to put the new port in and take the old port out! All in all it took right at 4 hours and 45 min to complete. We finally got to see our brave boy!!! I still can’t go into detail about how unreal I think this was!! Being scared because your son needs a bone marrow transplant is hard enough, but getting the very frantic call from your doctor saying your 2 year old needs emergency surgery because he has a tube in his heart takes it to a whole other level. The doctor was so wonderful. He came out to the waiting room and sat with us and explained everything, from the time he started until the time he finished the procedure. It was quite amazing to hear him talk about it, how he may never see this again. I told him to make sure he plays the lottery…..
We could feel everyone’s support and prayers. Thank you so much. We are so glad it’s over. Bo will have an echocardiogram next week and should get the all clear! Kim - Oh my god! I’m sitting here, reading your post with tears rolling down my face. I’m so so sorry. You, your family and especially Bo are amazing. Stay strong, you are all in my thoughts and prayers. sheri - Carolyn, thanks for taking the time to let us all know everything….I know you have so much in your life…please hug your family and tell them we love them all….and we won’t stop praying for Bo’s healing. Get your cheek swabbed, potentially save a life. It’s that easy. Bo may not be eligible for a bone marrow transplant yet, but at this very moment there are hundreds of families hoping, praying, and willing that today is the day they get the call. That today is the day someone they love very much has a match. Is it you? 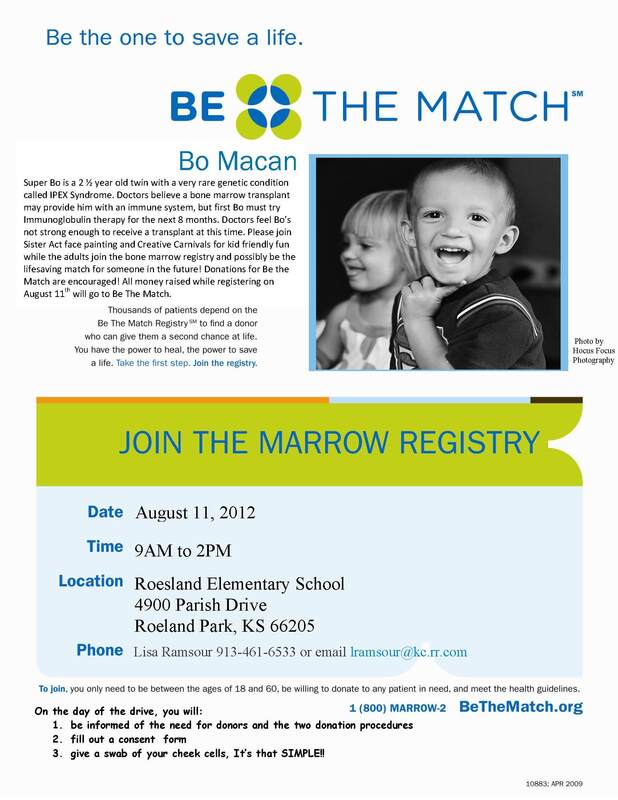 Team Macan It Happen is hosting a bone marrow donor drive at Roesland Elementary on Saturday, August 11, from 9-2. While adults get their cheeks swabbed, kids can enjoy face painting and a moonwalk. Everyone who donates (cheek swabs or money) will be entered into a drawing for a Rendezvous Package from The Raphael Hotel. There may even be a few other fun surprises. Come out, have fun, MAKE IT HAPPEN! Our trip to Cincinnati was good for the most part. It started out rough. After about 88 miles on the road, Bo was over being in the car. So we had to change-up some stuff, let’s just say we made pretty good timing considering my child. Monday we hung out, went to a few malls, did a little school shopping. Our wonderful friends, the Karns, who live in Columbus came down, Monday afternoon and spent their vacation with us! It was so nice to see them and our kids loved spending time together. Tuesday we spent the day at Kings Island, even though it was SO HOT! Bo and Brookie only spent a few hours at Kings Island it was way to hot for Bo, so my father in law took them back to the hotel (so nice of him). Johnny and I spent the rest of the day on a ton of rides, then we headed to the water park, while Leksi and John got a fast pass and rode roller coasters all afternoon. I was a great day! Wednesday we were up and ready to go, the hospital was about 18 miles from our hotel so we headed out a little early, good thing we did because the hospital was HUGE. I mean HUGE, it was crazy! We got to our room and a few people came in and we talked about the process which my child is now in. The “BONE MARROW PROCESS”. We went over all kinds of things, we got to tour the bone marrow floor, that was scary and very surreal. Once Dr. Marsh came in we jumped right in on our course of action. In her medical opinion said Bo isn’t ready for transplant. He is a very difficult kid medically and she is worried (which we have heard before) that his body will reject the new bone marrow. With that being said, she proceeded to tell us that there is a 20% mortality rate in cases like Bo. Well, John and I are not willing to take that risk right now! Our plan of action consists of this: 8 months of IVIG (immunoglobulin therapy) which is like a blood transfusion every 4 weeks through his port, except its boosting his levels and his immune system. It will go through his port and sounds like it’s not a big deal- BUT- we have to get insurance to approve it. Don’t even get me started on insurance. Last year from Sept 1-Mar 1, Bo spent a total of 50 days in the hospital which cost them around $749,000. If I were an insurance company I would approve IVIG BUT who knows!?! We will know in a week if it’s approved. All in all his transplant is on hold. It could be 1 month it could be 15 months, only time will tell. I hope insurance approves it quickly, I fear the flu season will be a rough one and I am not ready for that. So in less then 2 hours we will head to the hospital and get some much needed answers! Please pray today goes smoothly! Amanda McCoy - I love you and your gorgeous family after such a short time. We will be praying for the best! Sherlyn - Whoa, things just got a whole lot eaiers.